Does Updating iTunes Delete Songs? How to Delete iTunes Backup on PC/Mac? iTunesmobiledevice.dll is a shared dll file that is directly related to iTunesMobileDevice. It is a component of iTunes that handles some of its essential functions. Missing iTunesmobiledevice.dll can break the functionality of iTunes. That’s why it is recommended that you fix this issue as quickly as possible. As mentioned above, iTunesmobiledevice.dll is a shared dll file which is associated with iTunesMobileDevice, a component of Apple Mobile Device Support. While this component is separate from iTunes, it is needed for iTunes to work properly and perform its various operations. Some of the iTunes functions related to this dll file include iDevice detection in iTunes, upgrading the iTunes, downloading and reinstalling update, etc. When this dll file is missing, you will mostly likely see this error when you are trying to update your iTunes. You will see a message telling you that iTunes has got a bad image. As iTunesmobiledevice.dll is a shared dll file, it exists outside the iTunes software. While its separate existence offers many benefits and enhance the functionality of iTunes, a number of issues can occur if this file goes missing. A malware or virus can affect iTunesmobiledevice.dll file, causing it to become corrupted or deleted. Turning off your computer in an improper way or a power failure can lead to missing iTunesmobiledevice.dll error. Improper installation of iTunes is also a common cause. Issues in the Windows registry can also lead to this error. iMyFone TunesFix is the software that has been designed to solve various iTunes errors (such as iTunesmobiledevice.dll is missing). The software is highly efficient when it comes to detecting such issues. 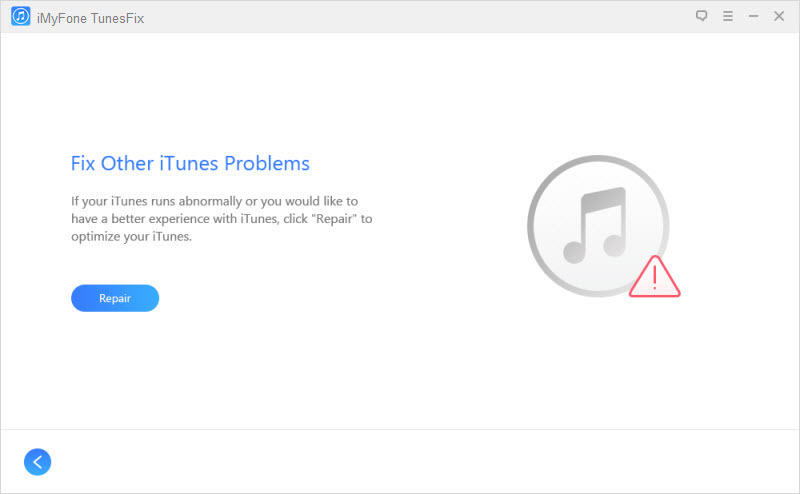 It automatically scans and detects the issues associated with iTunes and its components and then prompts to fix them via its ‘Repair’ function. Along with its automatic scanning function, there are many other repairing modes that you can manually try to solve some certain iTunes errors. All in all, TunesFix is the only software you need to fix all your iTunes problems. 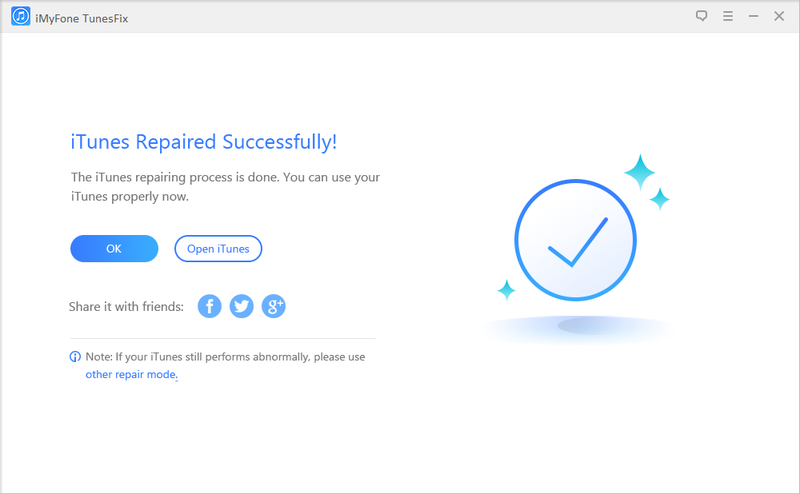 Quickly find different iTunes issues with automatic scanning feature of TunesFix and then fix them conveniently via its ‘Repair’ function. Manual repairing modes to further assist with fixing specific iTunes problems. ‘Quick Clean’ and ‘Deep Clean’ features to boost iTunes performance by deleting various iTunes-related files including backups, media, software update files, other related data, etc. These features also help free up space on your computer. Fix missing dll errors that break the functionality of iTunes. Fix iDevice detection issues with iTunes. Step 1: Launch TunesFix on your computer. The software will scan for iTunes issues at startup and then notify you about them if any of the issues are detected. You will be able to fix the issues via ‘Repair’ function. Step 2: If no issue is found, then you will be at the home interface of TunesFix. From there, select ‘Fix Other iTunes Problems’ mode. Step 3: Then click ‘Repair’ in order to start the repairing process. Step 4: During the repairing process, iMyFone TunesFix will download and install the repair drive, so make sure it has access to the internet. As iTunesmobiledevice.dll is directly related to iTunes, you can completely uninstall and then reinstall iTunes to fix the missing iTunesmobiledevice.dll error. Step 1: Completely uninstall iTunes and all of its related components from your computer. Step 2: Download the latest version of iTunes from Apple’s official website. 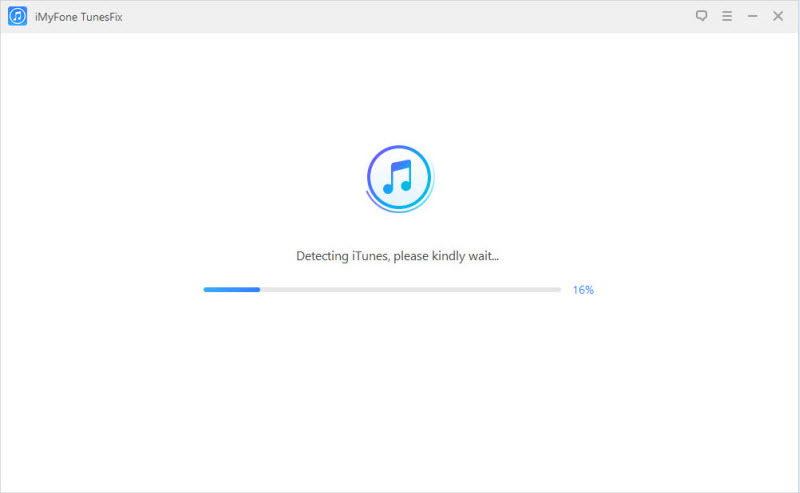 Step 3: Run the downloaded setup and follow the on-screen instructions to install iTunes. Missing iTunesmobiledevice.dll error should be fixed now. As mentioned above, missing iTunesmobiledevice.dll error can occur due to a virus or malware. So it is worth performing a full malware scan in your computer so that the problem is fixed. Use your favorite antivirus or anti-malware software to scan your computer. If none of the above mentioned methods fix this issue, then it is recommended that you update your Windows. Windows’ updates include various fixes and it is likely that missing iTunesmobiledevice.dll error will be fixed after you download and install the update. Step 1: Use the Start button of Windows to search and launch Windows Update. Step 2: Follow the on-screen instructions to check for updates and download/install if they are available.